Yerushalayim. A city that stands or is destroyed, because of one man's hatred of his brother. Or...one girl's hatred of her sister? With battle cries in the air, and so many young soldiers falling all around her, Chava Warinsky becomes engaged to a wonderful chassan. But like the trajectory of so much of her life, her joy is shortlived-because of her sister Tirtza. Yechiel Eisenman is denied his desire to sit and learn, as he is dragged into defending the Old City. But with his brother Chatzkel calling the shots, he finds himself playing a role that is a whole lot more dangerous than he ever anticipated. 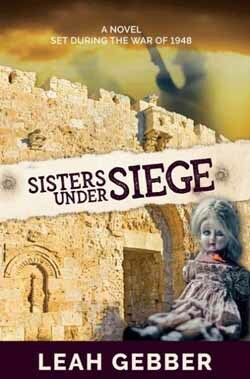 Sisters under Siege unfolds against the backdrop of Israel's raging War of Independence. In this beautifully written, intricately woven historical novel, readers are given a taste of the throbbing feelings of the time, the emotions that ran deep within every Jew of this era. And as we follow the painful and triumphant twists and turns of both the characters of this novel and the residents of Yerushalayim at this time, we discover that beneath the differences of every Jew is a core of goodness, a deep sense of caring for the other. Sometimes that goodness can push one to make great sacrifices for a brother-or a sister. And in those sacrifices lies hope. For in them lies the road back to Yerushalayim.